Sunset Hills, MO, Orthodontist Answers: Can You Play an Instrument While Wearing Braces? Our Sunset Hills, MO, orthodontist says it’s a common misconception that once you get braces, you won’t be able to play a musical instrument. With the proper knowledge and the right orthodontics team, you can straighten your teeth and enjoy playing your instrument with little to no interruption. Keep reading for advice from our Sunset Hills orthodontist. Before you take the braces plunge, our Sunset Hills orthodontist wants you to be aware that you have multiple options. If you spend a significant amount of time playing your instrument, then traditional braces might not be the best fit for you. A different treatment method, like Invisalign or Invisalign Teen, could be a better way to straighten your teeth while also allowing you to play your instrument without interruption. A great way to make playing an instrument easier while wearing braces is to use the wax provided by our Sunset Hills, MO, orthodontist. Waxing up your braces and wires creates a barrier between your braces and the inside of your mouth and lips. That way, you are less likely to encounter any irritation or develop painful sores. Some musicians go for a full appliance of wax, although it does have pros and cons, so contact our Sunset Hills orthodontist for more information. Want More Tips? See Our Sunset Hills, MO, Orthodontist! 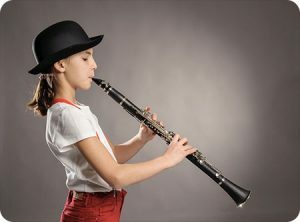 For more tips on playing an instrument with braces, contact our Sunset Hills, MO, orthodontist. Our expert team has the experience necessary to help you achieve a happy, healthy smile with as little interruption to your daily life as possible. If you’re experiencing painful sores or are having trouble adjusting to your new braces, a consultation with our Sunset Hills orthodontist will help you get back on the right track – call today! The information provided in this article is not meant to be medical advice and is for educational purposes only. If you would like to learn more about this and other orthodontic-related topics, feel free to contact Borello Orthodontics, with a convenient orthodontic office near Sunset Hills, MO, by clicking here or by calling 314.821.2400.